The end of 2017 is rapidly approaching, so let’s begin the final column of the year with a seasonally appropriate quiz. 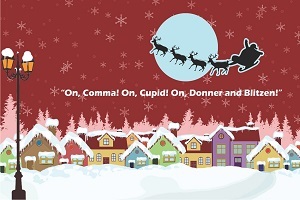 What’s the correct punctuation to be used in this Christmas carol title? If you are more comfortable with “you” instead of “ye,” substitute the words mentally; each tradition has its own history. The real question is where the punctuation ought to be. Think about it. We will talk about the answer a few paragraphs from now. We have already talked about using the comma properly a few times. You might think the topic has been exhausted. You would be wrong. The comma is the commonest punctuation mark, and also the most versatile; that implies it is also among the most often misused. Now, a single misplaced comma is hardly a tragedy; people will figure out what you meant to say. If you regularly misuse commas, though, you will gain a reputation for being a disorganized, undisciplined thinker. That can certainly be a wrong impression, but your readers know you only through the craft of your writing. Sloppy command of punctuation will not improve your reputation. If you are writing on behalf of a business, the business’s reputation may sink along with yours. Poor punctuation has consequences, and those consequences tend to be…unfortunate. It seems obvious, once you stop to consider it: punctuation marks act like directional signs in your text. Commas are placed in a sentence in order to clarify the meaning you intend. If the commas are moved elsewhere, then the meaning will change to something you didn’t intend. This implies that you must know the exact message you want to send with each sentence before you lock in the punctuation. That brings us back to “God Rest Ye Merry Gentlemen.” We can say for certain that the third version—the one without any punctuation—is almost surely wrong. See what I mean about having to know exactly what you are talking about in order to position commas correctly? Fortunately, most decisions on punctuation placement don’t require 15 minutes of online research. A little attention to meaning will get the job done. “Dr. Abrams attended the annual Charity Ball with her husband Arthur.” First impression: we imagine a charming couple, dressed in formal finery, entering a festive ballroom. Moments later, though, we begin to wonder if Dr. Abrams also has a few more husbands—Curtis, Larry, maybe even a Rex—waiting at home, dismayed that they were not chosen to be the doctor’s companion for the event. A comma between “husband” and “Arthur” in the original sentence would make it clear that Dr. Abrams has only one husband, and Arthur is his name; with the comma missing, we can speculate that any number of husbands may be stowed away somewhere. “We intend to show, that Mr. O’Hara was out of town when the bank was robbed.” It is almost always wrong to put a comma before the pronoun “that.” In this sentence, “We intend to show” isn’t a complete thought; there must be an uninterrupted path to “that” to establish what will be shown. The comma blocks that path. “I have a couple hours to kill my roommate went to a movie with her boyfriend.” An unfortunate text message. The writer probably doesn’t intend to murder her roommate. Some punctuation after the word “kill” would relieve our anxiety. “Unfortunately people with disabilities, are not always provided with opportunities to reach their full potential.” Two different mistakes lurk here. The sentence adverb “unfortunately” at the start needs a following comma to separate it from the rest of the sentence. But there should be nothing blocking the flow from the subject to the verb, so the comma after “disabilities” has got to go. “Our client fell from the scaffolding ruptured his spleen and was taken to the medical center by air ambulance.” It bears repeating: commas and other punctuation marks are road signs for the sentence. They tell the reader where he is, and they direct his attention in the right direction. A sentence without needed punctuation—like this one—requires multiple readings to sort out the intended meaning. Many readers will not put in the effort; they will simply give up. Are you a fan of our grammar and usage columns? Great! But we do a lot more. The staff here at Foster Web Marketing works year-round to bring you the best writing and marketing advice that you can apply immediately to your small business, medical practice, or law firm. Sign up for our newsletters or follow us on social media to keep track of the newest free information we are sharing.